Originally published by Fatte le dovute eccezioni, Torino 1997 page 18, edizioni Lupus in fabula. ‘Intervista a Radio Onda Rossa del 20 novembre 1997’, Autodifesa al processo di Roma per banda armata, ecc., Seconda parte, pp. 47-53. ‘Qualche considerazione d’un frequentatore di tribunale’ Dissonanze vol. VI, Catania 2000, pp. 48-50. Translated by Jean Weir for Digital Elephant. R.O.R.- Alfredo, can we go into the question of affinity groups and base nuclei for a moment, given that the prosecution are pointing a finger at these two points, extrapolating them from a series of interventions? R.O.R. — In fact the investigators, in particular the ROS, ( carabinieri special operations cops ) extrapolating a few phrases, a few concepts, have come out with the hypothesis of a double level, one open and the other underground. One level of let’s say clandestine activity and another which is carried out instead through the work of weekly periodicals and social centres and so on, maintaining that these concepts have been expressed in conferences in Greece. That does not seem to be the case to us. Can you explain better? In that case I must admit to not having been correct over the past twenty years in having subjected myself, putting a brave face on it, to various imprisonments, dozens of raids, over a hundred interrogations of every kind, not to mention the many times I have been stopped and candidly given my name and address, thus collaborating, that is true, with power. Certainly, it is of little importance to say that when, along with Pippo Stasi, I was arrested in Bergamo in 1989 following a robbery we refused (but only for a few hours) to give our names at the police headquarters — for precise reasons and not to be more revolutionary than the revolutionaries — I must admit it wasn’t a pleasant few hours as during the whole time we were systematically beaten according to the inveterate custom in police stations the world over throughout time. Now, I am not taking up the problem of torture here, or implying that it would be sufficient to give one’s name and address in order to avoid it, (as even in that case we would undoubtedly still have been beaten) I am saying that, apart from our very personal and good reasons, it does not seem to me that there exist general ones to suggest the contrary, valid for all times and circumstances. As a rule when I am stopped or arrested I answer such simple questions orderly and calmly, evaluating what I intend to and can say, discarding what I do not want to or cannot. From these first moments of impact, my (consent me) long experience suggests to me to start working out what my line of defence will be without dallying to make quite gratuitous declarations of principle, when it is not the inquisitors themselves to ask questions of a general nature, which obviously one does not refuse to reply to when they concern one’s identity as anarchists and revolutionaries. Nor do I believe that the decision to face the repressive mechanism on its own ground, i.e. the technical and judicial one of right and the law, means to espouse the bosses’ rights on the basis of which I am investigated, tortured, sentenced, imprisoned, etc. 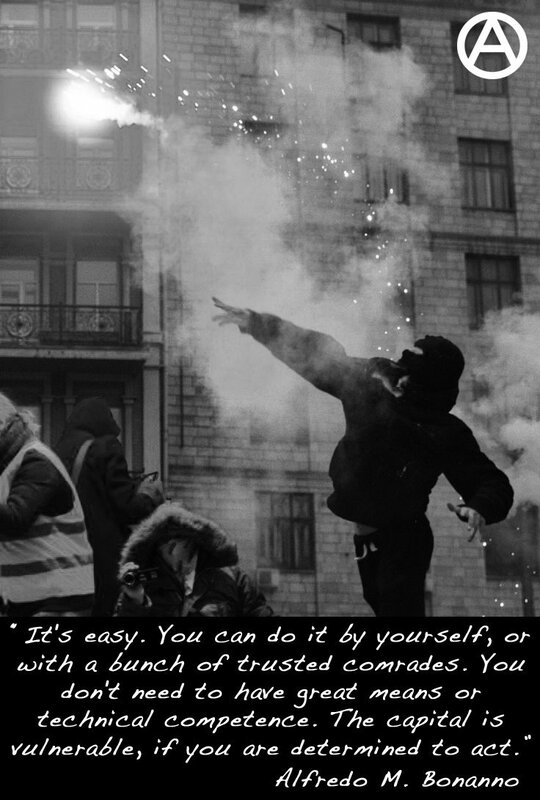 I believe that a revolutionary must struggle in all the fields that he finds himself in at a given moment in the alternating conditions of the clash. If one finds oneself in court, in the role of accused of course and not the judge, one must do everything to defend oneself, not so much out of self respect, and even less for fear of the consequences, but in order to gain the freedom of movement necessary to carry on with one’s own project. In fact, all the attempts made by the State to bring about trials are in the first place aimed precisely at preventively thwarting revolutionary activity, including analysis, relationships, projects, instruments, etc. By arresting, sending to trial, torturing and imprisoning, the State tries to break the revolutionary’s activity as a whole, not just their physical person, and it does this by keeping them away from this activity as long as possible. Defence, with every means, in every field, with the coherence and correctness that only the revolutionary themselves can choose and decide to impose on the enemy, is therefore an obligation. Not so much to oneself, because it would be easy to abandon oneself to the most exclusive refusal, to a superb attitude of distance and indifference, but towards one’s project, the other comrades developing it with you, and the exploited and oppressed who from this project might (or might not, that is another question) draw benefit or liberation. Next post: The Invisible Committee: Power is Logistic. Block Everything!